Thanks to your amazing support, we're celebrating a DECADE of DRAFT! It's been an insane roller coaster ride of draft focused IPAs, Porters and delicious creations across all beer styles. I would like to personally invite you to come out and celebrate with us as we begin our second decade together. We'll have tons of beer options, plenty of seating, an amazing live band lineup and some of the best food trucks around. 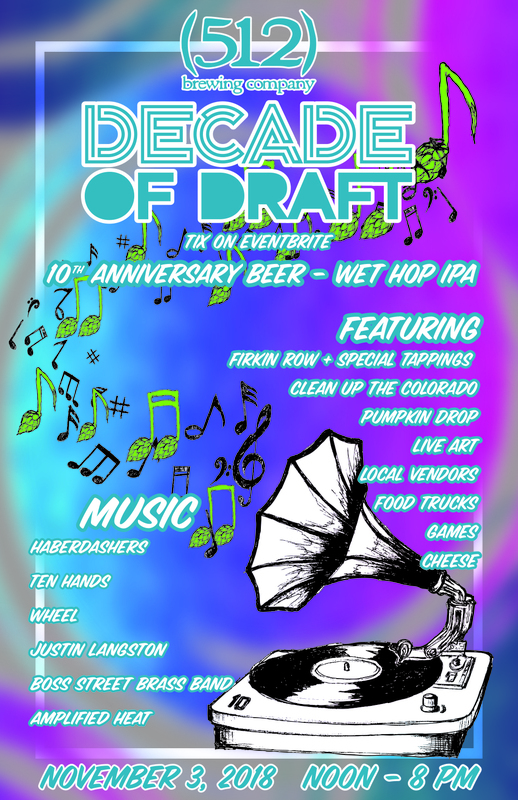 Visit our infamous FIRKIN ROW for some new creations made especially for the day and sip on our event release....DECADE. - Ride to Cap Metro SoCo Transit Center. - DECADE, this year’s anniversary release, is a true Wet Hop IPA brewed with 100lbs of Idaho 7 hops picked directly from the vine and shipped for brewing the next day. Draft Freshness meets hop freshness! - Barrel Dispensed WBADPP – we picked one special barrel of Whiskey Barrel Aged Double Pecan Porter and carbonated the beer directly in the barrel. The result is truly amazing! - Nice leashed dogs & supervised kids welcome!